Taking major inspiration from Kafka's 'The Trial' and Terry Gilliam's Brazil, as well some of its inflections from visual artists including Saul Steinberg (with his Masquerade series) and Rachel Whiteread, Strike! 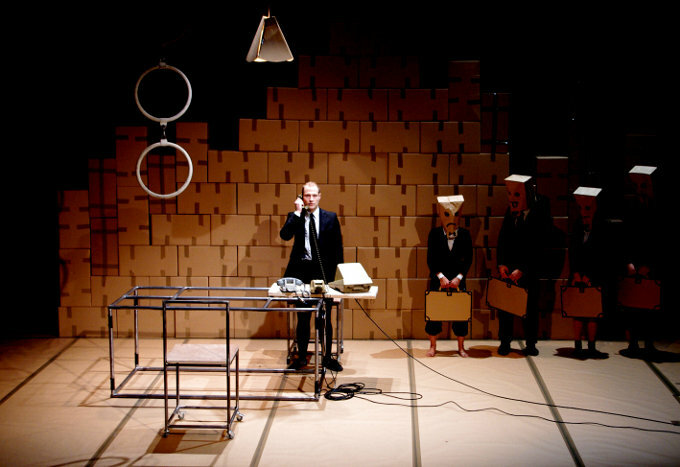 is a piece about the rhythms of work and the rhythms of the human body that plays out in a stylised corporate landscape built from 250 empty cardboard boxes. Elice has long black hair, Sanja's is long and orange. Then, an idea: why not hang from it? Like Sideshow on Facebook or be haunted forever by your missed opportunities. Mainline hours of contemporary circus performance with Sideshow's YouTube channel. Sideshow is a magazine and website that promotes, records and thinks about contemporary circus. Sideshow's current major projects include Deconstructing Circus, a series of 30 focused interviews with 30 circus artists and directors, and What is Contemporary Circus?, a five-part entry level introduction to the artform.